Chances are the hustle and bustle didn't leave you much time to really enjoy all that Lake Te Anau offers, so why leave the area after your wedding is over? 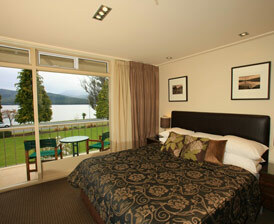 Taking your honeymoon at Distinction Te Anau Hotel & Villas is a journey in luxury. Honeymoons are meant to be a time you and your loved one will never forget so with our attention to detail we'll ensure your stay is something to really remember. Distinction Te Anau Hotel & Villas can supply all the delicate touches that set your experience apart from the ordinary. We understand it's the little things that make a big difference, so we'll provide all the ingredients for something special. Everything is taken care of from a delicious cheese plater and bottle of bubbles awaiting your arrival to a full cooked breakfast delivered to your suite the next morning. Alternatively, just pop your do not disturb sign on the door and we'll leave you to enjoy your stay in Te Anau in unsurpassed style. From $799.00 per night for 2 people. Please click here to view more and to make a booking.